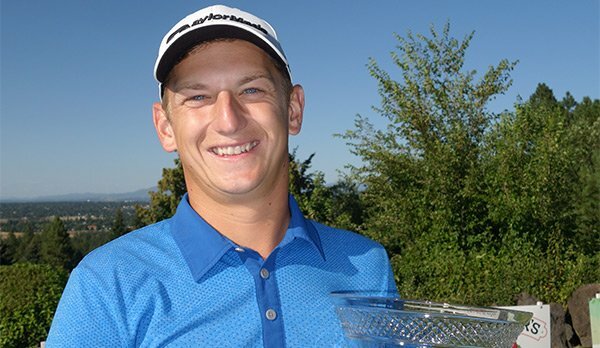 PGA Professional Brady Sharp of Walla Walla CC won the 30th Rosauers Open Invitational in a playoff against PGA Professional Russell Grove of North Idaho College. Sharp fired an 11-under par 60 to come from behind to force the playoff after making 11 birdies throughout his round. He then birdied the first playoff hole for the title of 30th Rosauers Open Champion. The 11-under par 60 shot by Brady Sharp today is a 18-hole tournament record at Indian Canyon GC. The Rosauers Open Invitational has been a part of the PNW PGA tournament program since 1988. The famed golf tournament has been hosted at just two facilities: Indian Canyon GC and MeadowWood GC. This year we returned to Indian Canyon GC in Spokane, WA, for the 30th Anniversary. We have had some amazing champions since the event started. PGA Professional Corey Prugh of Manito CC (2009, 2011, 2013 & 2015) holds the record for the most wins. Derek Bayley set the 54 hole-tournament record of 189 (27-under par) at MeadowWood GC in 2016. Amateur Derek Bayley of The Links GC (Post Falls, ID) also holds the 18 hole tournament record of 59, 13-under par the same year. Indian Canyon was built in 1935 for $200,000. H. Chandler Egan, a member of the PNGA Hall of Fame, crafted the Canyon’s layout over the well-treed hillside southwest of the Spokane River. This municipal track has been annually rated among Golf Digest’s “Best Public Courses”, “Best Affordable Courses”, “Best Golf Courses You Can Play”, “Best in State” and taken individually, some holes rank with the best holes found on any course – public or private – in the region.